LAGI 2014 Copenhagen invites designers from around the world to submit their ideas for what infrastructure art of sustainable cities looks like. The call is to envision public art that generates utility-scale clean energy for the City of Copenhagen. The Land Art Generator Initiative (LAGI) brings together artists, architects, scientists, landscape architects, engineers, and others in a first of its kind collaboration. The goal of the LAGI is to see to the design and construction of public art installations that uniquely combine aesthetics with utility-scale clean energy generation. The works will serve to inspire and educate while they provide renewable power to thousands of homes around the world. The 2014 Land Art Generator Initiative, in partnership with Refshaleøen Holding and other project partners, calls on artists and designers to submit proposals for a pragmatic art installation for the design site at Refshaleøen, located across the water from the iconic Little Mermaid Statue. A qualified entry must fulfill the following requirements and be developed to a concept design level of detail. The competition is free and open to everyone. LAGI encourages designers, artists, engineers, architects, landscape architects, university students, urban planners, scientists, and anyone to enter who believes that the world can be powered beautifully and sustainably. There are no restrictions on team size and/or makeup. The competition is open to everyone, but is in particular aimed at artists, urban planners, architects, landscape architects, and engineers. It is recommended (but not mandatory) that the team be comprised of interdisciplinary members so as to arrive at the most well-conceived result but we also recognize that great ideas can spring from individual efforts as well. As an international design competition, the Competition is open worldwide to professionals, any member of the public, and to students. An Entrant may either make a Submission individually or as a team (“Entrant”). Each team shall identify one team member as its Point of Contact (“Point of Contact”) during the upload process. All persons or businesses who are or were involved in the organization of the competition or have contributed signiﬁcantly to formulating the competition design guidelines. Representatives or employees of the competition promoter. Employees with, partners of or employees of any member of the jury or adviser to the jury. Persons who are close relatives of or have a close familial relationship with any member of the jury or adviser to the jury. Enterprises that are wholly or partly owned by persons who are close relatives of or have a close familial relationship with a member of the jury or adviser to the jury. Any employee, volunteer, or board member of Society for Cultural Exchange or the Land Art Generator Initiative. No matter how a person is involved in the preparation of an entry, he or she must be aware of the above rules. 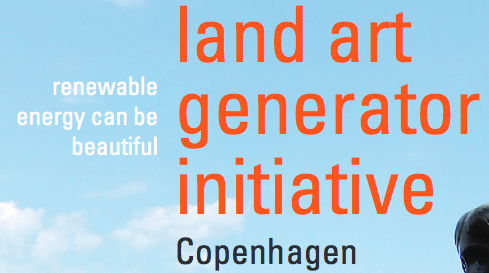 In case of doubt, contact lagi@landartgenerator.org. Consist of a three dimensional sculptural form that has the ability to stimulate and challenge the mind of visitors to the site. Capture energy from nature, convert it into electricity, and have the ability to store, and/or transform and transmit the electrical power to a grid connection point to be designed by others. Not create greenhouse gas emissions and not pollute its surroundings. The work must not impact the natural surroundings negatively. Be pragmatic and constructible and employ technology that can be scalable and tested. Entries must be in English and metric scale. $15,000 (USD). Two members of the first place winning team will be flown to Copenhagen for the award ceremony and exhibition opening. Accommodations and airfare will be provided, but Visas and other travel requirements are the responsibility of the team members. Register your team by creating an account (see the link in the sidebar of the official website). Under Log In, click Register. Enter your username and email address. You will receive a password and confirmation via email. We recommend that you register the first time you visit the site. This way you will stay informed of all LAGI 2014 competition updates via email. If you encounter any difficulties, please email lagi@landartgenerator.org and we will register you manually. It is important to visit the official website (link to it below) for complete and detailed information on this competition and also on the correct 'Submission Format' and 'How to Submit Your Entries'. Submissions will be accepted until May 18, 2014 at 23:59 (11:59pm) GMT. Land Art Generator Initiative design competition ("Competition") is a project of Society for Cultural Exchange ("SCE") and is administered solely by SCE. The award money is a cash payment from SCE to the winning designer and is not related to costs of detailed design or construction of the work. There is no guarantee of any of the submitted designs being constructed. All Submissions shall be vetted for eligibility and strict adherence with all Competition Rules and Criteria as defined herein or in any associated Competition Guidelines (or similar). Jury review shall be preceded by a shortlisting process in coordination with Partners and informed by community events and public feedback. The shortlisting process shall proceed at the discretion of SCE. Entrants will not be notified of their status with regard to shortlisting. Jurors shall have no access to the identity of the Entrant but shall refer to the Submissions by their unique 8-digit identification code. The Jury shall identify through their deliberation a First and a Second place winner. First Place will receive $15,000USD in award money. Second Place will receive $5,000USD in award money. Accordingly, SCE will notify the First Place, Second Place, and Shortlisted entries (“Winners”). SCE reserves the right to change any rubric related to or in identifying any Winner.